> Site blogs - View blog posts and responses from other Moodle participants. > Tags - View and click on tags that were used in different blog posts. This makes it easy to quickly find topics that others are talking about. > Calendar - See assignments and tests for different courses combined into one place. > Site news - Where you can view and read the news that was posted to the course. Profile: View and edit your profile settings such as your country, city, and email. Current Course: Navigate to all components of the course you are currently viewing. 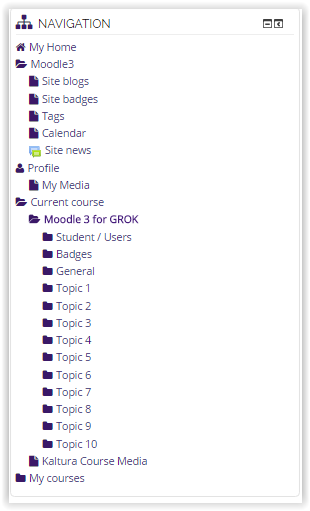 > Topics - Each topic will have its individual components in the folder. My courses: Navigate to all of the different courses for which you are currently enrolled.